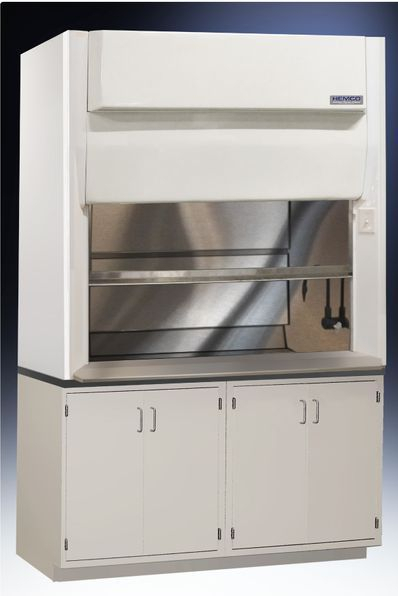 UniFlow Radioisotope Fume Hoods are available in 48”, 60”, & 72” widths. 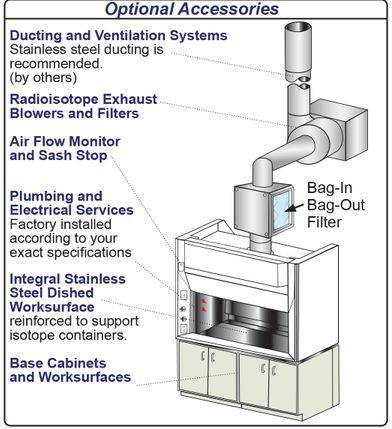 Interior fume chamber is constructed of welded type 304 stainless steel to prevent absorption of radioactive and corrosive materials. Stainless steel baffle is removable for ease of cleaning. Worksurface is welded integral to the fume chamber and reinforced to support heavy isotope shielding materials. UniFlow Superstructure to be non-metallic FRP composite construction for total chemical resistance (NO RUST), superior durability and long life. Interior fume chamber to be glass-smooth with VaraFlow baffle system & bell shaped exhaust collar. Meets NFPA 45 requirements for flame spread. Air Foil & Worksurface are constructed of type 304 stainless steel. 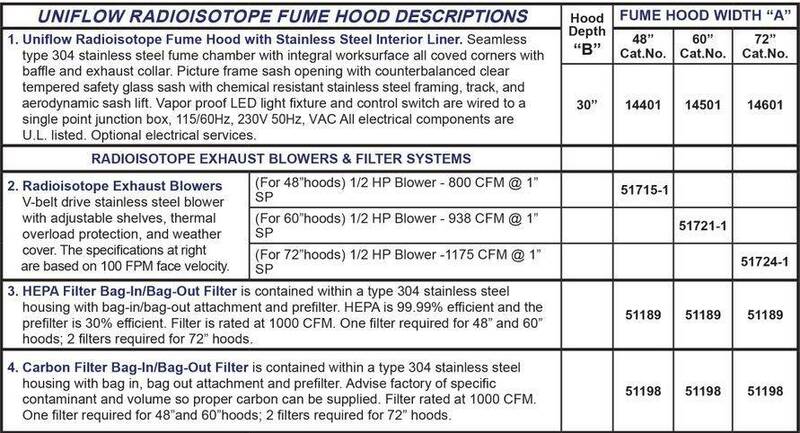 Fume Chamber surface is type 304 stainless steel, # 4 satin finish. 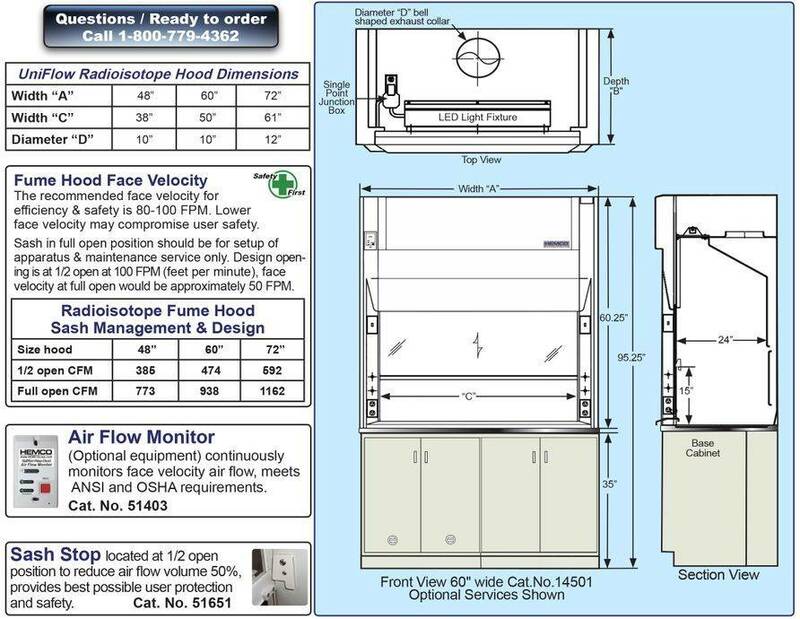 VaraFlow Baffle System maintains uniform air flow thru the fume chamber to exhaust collar outlet. 28” Vertical Sash Height provides ease of access for apparatus set-up in fume chamber. 24" interior reach in depth, and 44" interior working height. Sash is perfectly counter balanced, 3/16 tempered safety glass, coated stainless steel cable with stainless steel pulley assembly. Framed in Stainless steel framing, track, and aerodynamic sash lift for ease of movement and air flow efficiency. 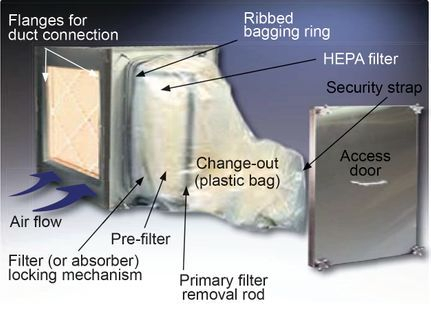 Angled Picture Frame Opening the aerodynamic face opening with stainless steel air foil provides uniform air flow into the fume chamber.